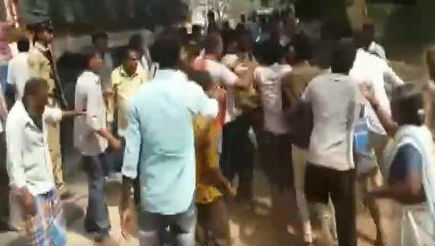 Amaravati, April 11: Clashes broke out Thursday between workers of Telugu Desam Party and YSR Congress at various places in Andhra Pradesh even as technical glitches in Electronic Voting Machines hampered the poll process at numerous polling booths as voting got underway for 25 Lok Sabha and 175 Assembly seats. In Guntakal, former MLA and contesting candidate of Jana Sena Party, Madhusudan Gupta, smashed an EVM in a fit of rage alleging that party symbols were not properly printed on the ballot unit. He also shouted at the polling personnel on duty. Andhra Pradesh Lok Sabha Elections 2019: TDP, YSRCP Workers Reportedly Killed During Clash in Anantapur. Gupta was immediately taken into police custody. A mandal parishad member of YSRC was seriously injured when TDP workers allegedly attacked him at a polling station in Eluru city. In Jammalamadugu in Kadapa district, tension prevailed in Ponnathota village as YSRC and TDP workers indulged in stone-throwing. In Narsaraopet constituency in Guntur district, YSRC leaders alleged TDP men ransacked a polling station in Yelamanda village and damaged the furniture. Police personnel were also preventing YSRC sympathisers from entering into the polling booth, they alleged. Minor trouble was also reported at a few other constituencies in Guntur, Prakasam and Anantapuramu districts as well but neither the election authorities nor the police confirmed the reports. State Chief Electoral Officer Gopal Krishna Dwivedi, however, said polling was going on peacefully across the state. In a statement, the CEO asked people not to believe in rumours as the poll process was going on peacefully. Pawan Kalyan Says Chandrababu Naidu Will Lose Andhra Pradesh Assembly Elections 2019. He said the technical defects in EVMs, reported from various places, have been rectified. Chief Minister N Chandrababu Naidu and his family members exercised their franchise at a polling station in Undavalli village in state capital region Amaravati. His son Nara Lokesh, incidentally, is the TDP candidate from Mangalagiri Assembly segment that covers Undavalli. Talking to reporters, the Chief Minister referred to technical glitches in EVMs and said he was demanding that ballot papers be re-introduced. "No developed country is using EVMs as they are prone to manipulation. We have hence been demanding that we revert to the ballot paper system," Naidu said. YSR Congress president Y S Jaganmohan Reddy cast his vote in his native Pulivendula in Kadapa district, from where he is seeking re-election. "I am very confident that people are looking for a change," Jagan, who is aspiring for the chief minister's post, remarked. Jana Sena president Pawan Kalyan exercised his franchise in Vijayawada.State Chief Secretary L V Subrahmanyam also cast his vote in Vijayawada. Interestingly, the VVPAT machine did not function when Dwivedi voted. This is the first general election in the state after bifurcation of Andhra Pradesh and creation of Telangana in June 2014. There are a total of 3,93,45,717 registered voters, including 1,94,62,339 men, 1,98,79,421 women and 3,957 transgenders. Of the total, 10.15 lakh are first-time voters in the 18-19 age group.